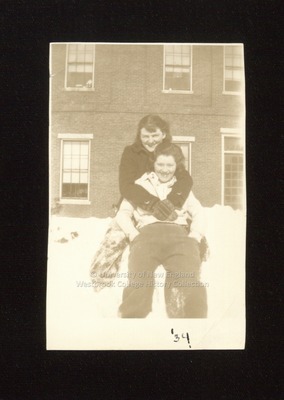 Two Westbrook Junior College students stand in a snowbank on the side of Hersey Hall or Goddard Hall in this sepia toned candid snapshot labeled '34. The girls wear snow pants and short snow jackets and stand one in front of the other. The girl behind has her arms crossed over the shoulders of the girl in front. On the back of the photo is written: In dark ink "Peg Sheehy--Rumford. Pauline Kemple--Presque Isle." In pencil "Just 2 of the girls." In blue ink "Do I remember Kemple's pants!!! (I borrowed them & sat in fresh paint on a drug store stool at Morrill's Corner)"